Molds for kilncasting fall into two broad categories: open-faced or closed/semi-closed. In open-faced molds, one side of the mold is completely open; the cold glass is placed directly into the mold through that opening. Using open-faced molds, you can create reverse-relief, bas-relief, pâte de verre, thick-block, and box castings. You can use Bullseye slumping molds for open-faced kilncasting. In molds that are closed/semi-closed, the mold is open only wide enough to allow the glass to flow in from the outside, often through a reservoir. 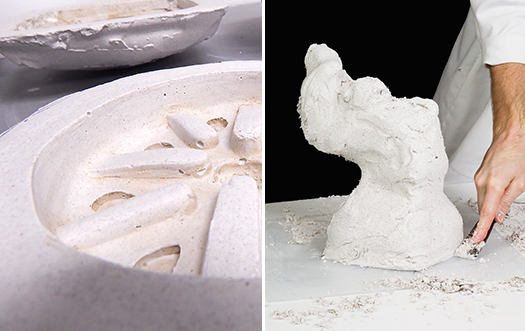 Using closed/semi-closed molds, you can make fully sculptural pieces. How do I precent sharp edges in castings?